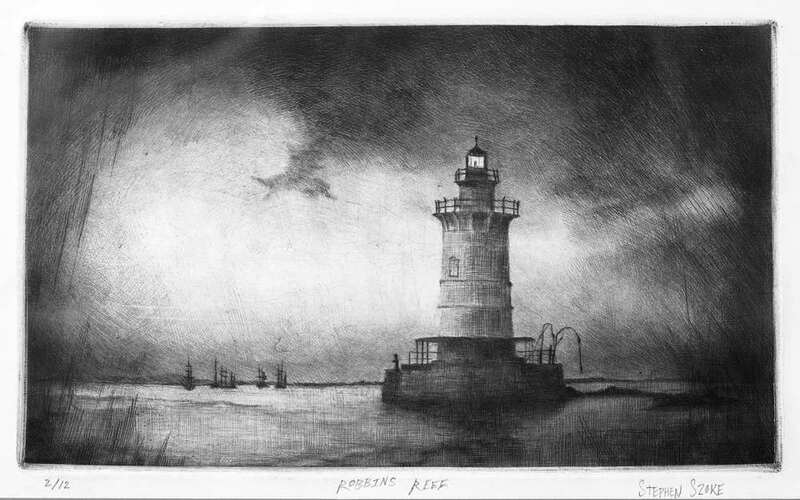 The U.S. Department of General Services granted the deed to Robbins Reef Lighthouse to the museum in 2011. Originally named Robyns Rift by early Dutch settlers in New York because it was a gathering place for seals, the lighthouse stands on a rocky reef located off Staten Island’s North Shore. The exhibition includes the history of the lighthouse, particularly at the time of its most famous keeper, Katherine Walker (1848-1931), the process of its current restoration by volunteers, and historic and contemporary interpretations by artists. After her husband John died in 1890, Kate Walker kept the lighthouse until 1919. She lived there with her two children, Jacob and Mary, and later with her daughter-in-law Loretta and her five grandchildren. 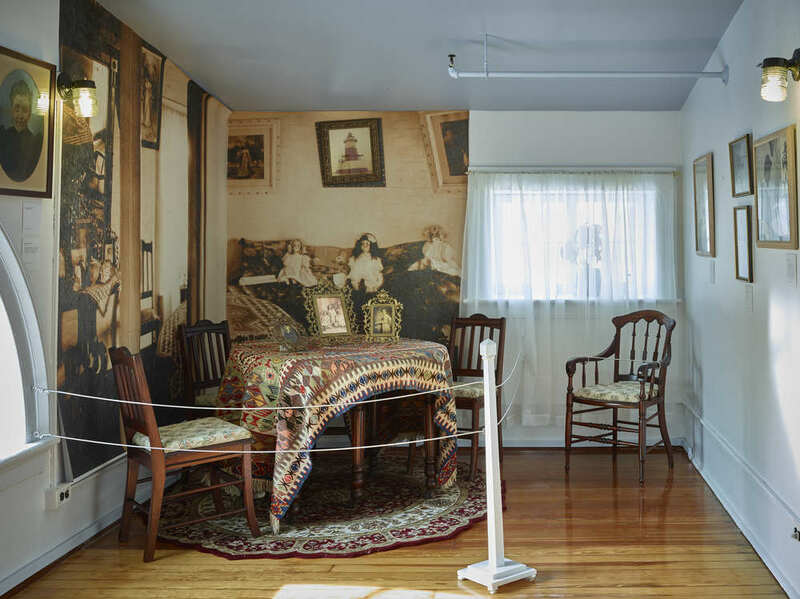 Using original furniture and artifacts from the collection of the Walker family, specifically Kate’s great-great granddaughter, Barbara Pezzengrilli, museum staff have created a facsimile of the warm home she established in the cast-iron “spark-plug” beacon. While caring for the family, Walker kept the kerosene lights that illuminated the Harbor and the dangerous reef on which the lighthouse stands. Over the course of her 29-year tenure, she rescued at least 50 people, withstood numerous storms, reported on ship accidents, and almost never allowed her personal circumstances to interfere with her work protecting sailors from harm as they entered and left New York Harbor. The museum invited several contemporary artists to depict the lighthouse, and included important historical depictions, such as the Chrysler Museum’s original Sunset, New York Bay, by Edward Moran (1829-1901). Moran was particularly fond of Robbins Reef, as was the museum’s namesake, John A. Noble (1913-83), who did a plein air drawing from his rowboat of the structure that is also included in the exhibition. Contemporary works of art featured in the exhibition are paintings by Kathy Fieramosca, Denise Mumm, Robert Padovano, Pamela Talese, Len Tantillo, Dan Thompson, and Sarah Yuster, and drawings by William Behnken, N.A., Elle Finn, and museum Trustee John Stobart, R.A. Brian DeForest, Michael Falco, and Michael McWeeney captured the lighthouse in photographs, and printmaker Stephen Szoke captured it in an etching; Szoke is Kate Walker’s great-great-great grandson. DB Lampman and Roger Sherry have created mixed-media interpretations, and Bascove created a collage of images of the lighthouse and its history. Robbins Reef Lighthouse: A Home in the Harbor was made possible, in part, with grants from the Richmond County Savings Foundation; the New York City Department of Cultural Affairs, in partnership with Councilwoman Debi Rose and the City Council; Staten Island Borough President James Oddo; the New York State Council on the Arts, with the support of Governor Andrew M. Cuomo and the New York State Legislature; New York State Assemblyman Matthew Titone; Caddell Dry Dock and Repair Company; Donjon Marine Company; and Eileen Montanez. The restoration of the actual lighthouse is an on-going program of the Noble Maritime Collection.